The groin here is actually the remnants of an unused sewage outfall. The structure is cracked and bolstered with rocks. 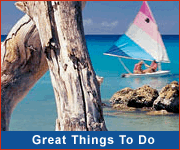 This allows sand to seep through to the adjoining beach and offers good conservation. The Coastal Zone Management Unit was behind the move to build an island wide sewage catchment and holding area. Pipes are laid under the roads throughout the island. Raw sewage is pumped 500 feet into holding areas. 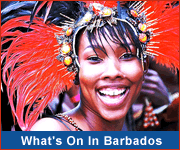 Waste water is filtered and purified when it passes through the sandy soil and coral of Barbados. Even if it got to the sea, bacteria will die in salt water and sunlight. But it was the acid content of sewage and runoff that caused severe damage to the reef and inshore habitat. There are signs of recovery now, just 2 years after the project was completed. 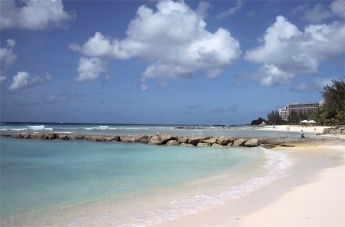 The beach to the Barbados Hilton is one of the more stable beaches in Barbados. The sea floor is covered with rubble on which algae grow. Wave action breaks the algae off the rubble and washes it ashore. The algae turns to powder in the sunlight. 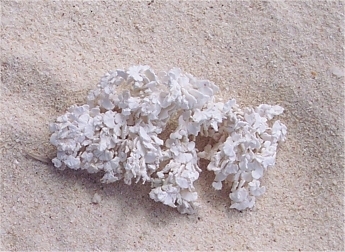 This creates the soft white sand beach noted in the area. The beach grows as more algae is washed up. The pink tinge is from another algae also washed up. 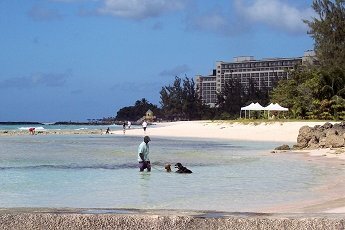 Man and his best friends enjoy the new beaches formed along the south coast boardwalk. Some pools are formed by the natural reefs, while others are formed from man-made protective structures. Both types make perfect spots for a cooling dip in the sea! View more boardwalk photos on Facebook!